EAST COAST FLATHEAD FORD RACING ASSN. We are working on 2013 ECFFRA Poster !!! 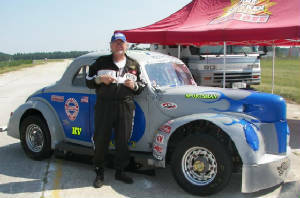 Welcome to the Official Web Site of the East Coast Flathead Ford Racing Association. Please enjoy these pages to enlighten yourself on the Flathead Ford V8 racing engine and cars that we so enjoy. Our Guys love Reds Headers!!!!!!!!!!!!!!!!! ECFFRA is a group of antique FORD race car owners,drivers, friends and family from Virginia, North Carolina and South Carolina. We not only restore and show these antique racing machines, we actually race them wide open at tracks in Virginia, North Carolina and South Carolina. Check our Schedule and come out and see what it was like in the early days of racin'. Worlds Fastest Flathead Race Car will fly!!!!!!!!!!!!!!!!!!! ECFFRA was formed and is dedicated to preserving the rich heritage of Ford Stock Car Racing in 1932 to 1948 ford automobiles with the famous flathead V-8 powerplant. 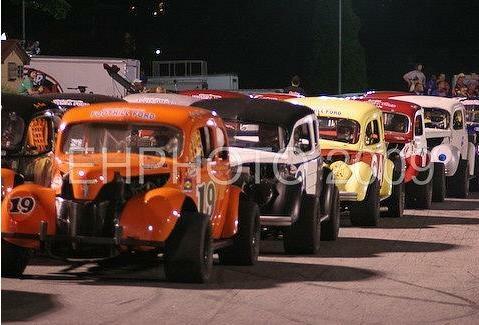 These cars are lovingly restored to race condition and compete "wide open" at every race meet. #19 On the Pole at BGS and ready to RACE!!!!!!!!!!!!!!!!! Come to the races and meet our members. See if what we do and how we do it is to your liking. To stand for membership, you must have a sponsor that is a regular member in good standing. You need to come to the monthly meeting and stand for a vote by the whole club. ECFFRA is a club that enjoys the fellowship of its members and their love for the flathead ford. Let us hear from you if your interested in our club. The link below will send an email to us. Will be the second Monday night of the Month. Don't miss it as we will be "bench racing" and give information on the upcoming races and anything else that the members wanna talk about. FUN, FELLOWSHIP and RACING! See ya there! Second Monday - Meeting at OLYMPIC in Kernersville, NC. Eat at 6pm meeting to follow. Don't Miss it. WE WOULD LOVE TO HEAR FROM YOU. JUST FILL IN THE BELOW FORM WITH COMMENTS, QUESTIONS, SUGGESTIONS OR JUST TO SAY HI and YOU LIKED THE SHOW!! 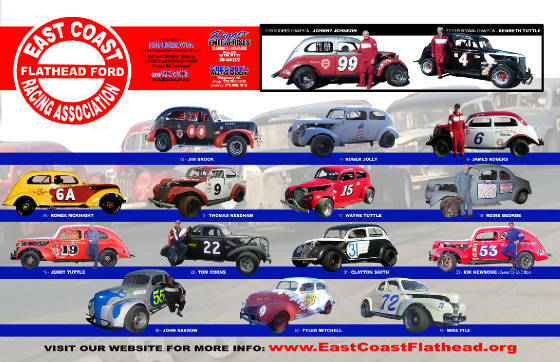 The 2015 ECFFRA Poster features all your favorite flathead drivers and owners and full color pic's of their racing machines. Its free and you can have one by contacting our PR Person at the track or any of our members. Don't forget to bring your sharpie too for autographs. Shoot, get them all to sign. Heck, they may be over the hill, but its all about the fun, fellowship and rich history of flathead ford stock car racing. The Folks in our Sports Marketing Office are working their fingers to the bone to come up with the ALL NEW 2015 ECFFRA POSTER. You Car Owners and Drivers, Get your pics in to the Sports marketing Office ASAP!!! More later! 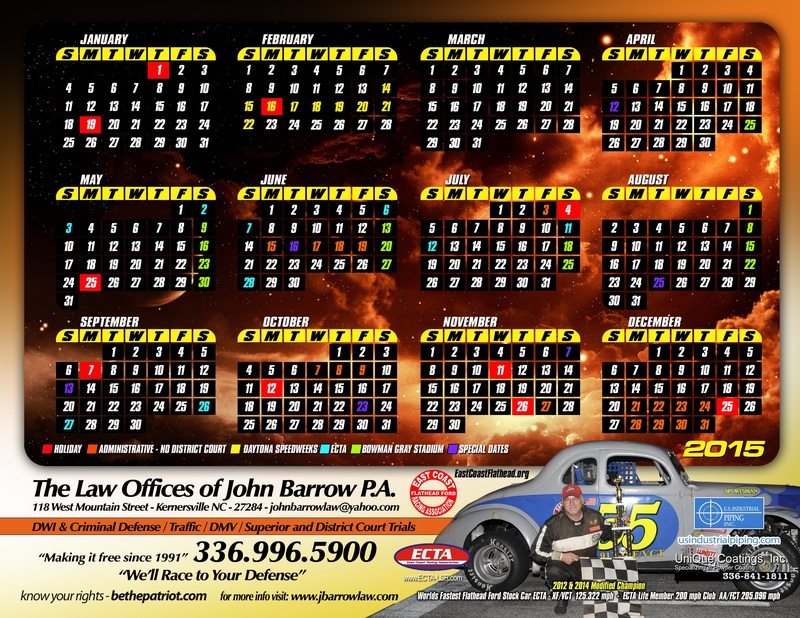 Come out and see History racing at the track and get a FREE 2015 ECFFRA POSTER or an Official 2015 Law Offices of John Barrow Racing Calendar. "The Original (and officially the FASTEST) Flathead Ford Racing Club in SC, VA and NC"
All Rights Reserved 2015 East Coast Flathead Ford Racing Assn., Inc.